Our family has been hit particularly hard this Fall with various viruses and illnesses. About a month ago, 3 of the 5 of us in our family had the H1N1 virus and this last week we all have shared a very nasty stomach bug which has left us all without much energy and a few pounds lighter. I suppose with one child in public schools, another in pre-school, and the fact that we get never get a full-night's sleep as the baby gets up 2-3 times a night, we're just a pretty run-down lot that has been hit on all sides recently. Luckily, Summer (4 months old) has been able to escape the H1N1 and had just a day of the stomach virus as she has been our main concern. I suppose there is no better time in the year to hunker down, rest, relax, and focus on getting better. 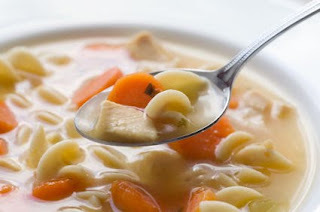 I hope all of you and your families stay healthy and for those of you who are under the weather like us, I hope this virtual chicken soup makes you feel a bit better! I hope that you are all feeling better and having a beautiful December!